Sectiones: A. sect. Araucaria – A. sect. Bunya – A. sect. Eutacta – A. sect. Intermedia – †A. sect. Perpendicula – †A. sect. Yezonia – †A. sect. indet. 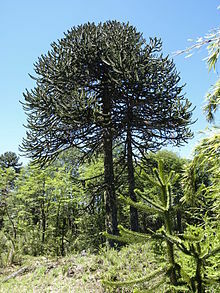 Type species: Araucaria araucana (Molina) K.Koch, Dendrologie 2(2): 206 (1873). Designated as synonym Araucaria imbricata Pav. Mem. Acad. Med. Madr. 1: 109. (1797) nom. illeg. superfl. Dombeya Lam., Encycl. 2: 301 (1786), nom. illeg. Govaerts, R. et al. 2015. Araucaria in World Checklist of Selected Plant Families. The Board of Trustees of the Royal Botanic Gardens, Kew. Published on the internet. Accessed: 2015 April 27.
International Plant Names Index. 2015. Araucaria. Published online. Accessed April 27 2015. Tropicos.org 2015. Araucaria . Missouri Botanical Garden. Published on the internet. Accessed: 2015 April 27. For more multimedia, look at Araucaria on Wikimedia Commons. This page was last edited on 22 February 2019, at 04:17.